The Saint James School Alumni Council was formed to provide meaningful engagement opportunities for all SJS alumni. In partnership with the Office of Development and Alumni Relations, the Alumni Council oversees the Class Agent system and works to build an alumni community of support for the School, specifically encouraging financial support through the Annual Fund. The Council meets four times throughout the year. Members help organize Alumni Weekend events and assist with the Saint James Golf Classic. The Council also assists in planning a variety of regional alumni gatherings. The Alumni Council is comprised of alumni of the School representing a range of graduation years. The Senior Prefect, Headmaster, and members of the Office of Development and Alumni Relations attend meetings as ex-officio members. Members are committed to a three-year term. If you are interested in serving on the Alumni Council, please contact Greg Wilson in the Office of Development and Alumni Relations to submit your name for consideration. To review our Alumni Council Bylaws, please download the below PDF. 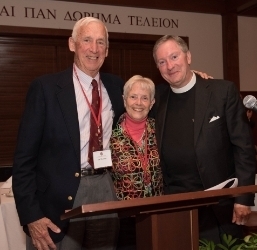 During Alumni Weekend, the Alumni Council hosts a dinner and awards ceremony in honor of SJS alumni. Three awards may be presented: the Alumni Award, the Kerfoot Society for Distinguished Faculty, and the Exceptional Service Award—all sponsored by the Alumni Council. Each year, alumni are invited to nominate deserving candidates. Below is information about each award. Please click on the award for a description, nomination form, and a list of past recipients. Each year, the Saint James School Alumni Council honors alumni who have distinguished themselves with outstanding service to the School and to society. Alumni of the School may nominate candidates for this award. To nominate a candidate, please download the Alumni Award nomination form. Additional support materials may be included with the completed nomination form. Nominations may be mailed, faxed, or emailed to the Office of Development and Alumni Relations. Established to recognize faculty members who distinguished themselves above and beyond the call of duty, the Kerfoot Society for Distinguished Faculty was originally suggested by Jeremy H. Biggs '54 when he served as President and Chairman of the Board of Trustees. He expressed that "a good part of the soul of the School is, and always has been, the wonderful and long-serving faculty who have been important to its history and to the lives of its students." Alumni of the School may nominate candidates for this award. To nominate a candidate, please complete the Kerfoot Society for Distinguished Faculty nomination form. Additional support materials may be included with the completed nomination form. Nominations may be mailed, faxed, or emailed to the Office of Development and Alumni Relations. The Exceptional Service Award honors individuals who have provided exceptional service to the School and its alumni. Nominees do not need to be alumni or faculty of the School. The award is presented at the discretion of the Alumni Council. Nominations are considered on an annual basis. Both current and previous faculty and staff members are eligible for this award. Alumni and friends of the School may nominate candidates for this award. To nominate a candidate, please download the Exceptional Service Award nomination form. Additional support materials may be included with the completed nomination form. Nominations may be mailed, faxed, or emailed to the Office of Development and Alumni Relations.